I'm trying to find ways to make journaling and time with God something more tangible and enjoyable for myself whereas now, I feel it's almost like a chore. I'm not getting a ton out of my sessions because I have a 100 other things bouncing around my mind and I don't disconnect and spend it solely in the word. Knowing that's just how I work I wanted to get a new journaling bible and commit. 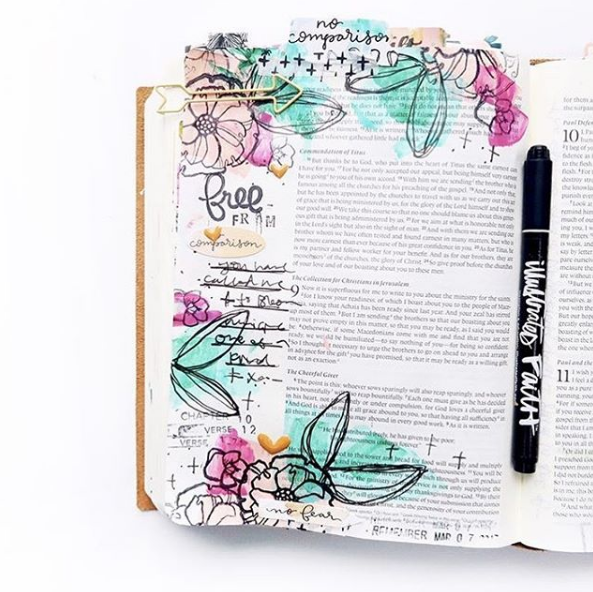 I found Illustrated Faith on Instagram maybe 2 months ago so when I got my journaling bible in, I ordered a few things from Dayspring to make it a full decompressing session when I'm reading my bible now. It's been such a nice change because I'm loving the time I have solo doing this. I leave my time reading feeling refreshed and relaxed and getting so much more out of that few minutes with God. What are some ways you disconnect from it all and make time for God? I'm doing it first thing in the morning or at nap times so I spend the second half of my day filled up. I'd love to know your tips and tricks for making it a priority!